The Tibetan plateau is aptly called 'the roof of the world'; it is the largest plateau on earth with an average elevation of over 4000 meters. These vast rugged plains are starkly contrasted by more than 50 snowy peaks of over 7000 meters, and massive glaciers that form the head-waters of Asia's greatest rivers. 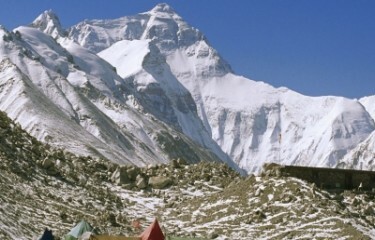 Mount Everest's famous north face is accessed from Tibet. Tibet holds an enchanting allure to curious travelers interested in exploring extraordinary dimensions of intriguing history, culture, religion and nature. The friendly Tibetan people are deeply devoted to their ancient Buddhist religion, which dates back to the 8th century. Brightly painted monasteries with golden roofs, monks in deep crimson robes and ancient religious art are some of the symbols of their spiritual devotion. In Lhasa, the 7th century Potala Palace, strategically placed atop the Red Mountain, symbolizes the central role Tibetan Buddhism has played in the administration of Tibet. The Dalai Lama once spent the winters in this architectural masterpiece. The ancient Jokhang Monastery, also 7th century, is encircled by Barkhor Street which functions both as an exotic commercial market and as a place for pilgrims to walk clockwise chanting and turning prayer-wheels. Primitive houses of solid stone testify the Tibetans’ resilience to survive in a harsh environment. Just outside of Lhasa, the historical towns of Gyantse, Shegar and Shigatse with their monasteries and forts, provide glimpses into the history of old Tibet. In western Tibet, 1900 km from Lhasa, are the crumbled remains of the 10th century Kingdom of Guge. Endless caves, secret paths, burial places, ruins of palaces, pagodas and the encircling fortress walls tell the story of the long lost dynasty. Mount Kailash is a sacred destination for Buddhist, Hindu and Jain pilgrims as well as trekkers. Although no one is allowed to climb this holy mountain, pilgrims come here to trek around it. The Kailash Kora refers to the 52 km circuit trek around the mountain. Pilgrims believe this ‘kora’ takes away sin and brings good fortune, and complete the pilgrimage with a bath in the clear cold waters of nearby Lake Mansarovar, which promises salvation.